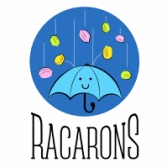 ​Racarons, located in the San Francisco Bay Area (Mid-Peninsula/South Bay), is a pop-up bakery that specializes in making French macarons. Using the best ingredients, like Valrhona White Chocolate and European Style Butter, Racarons produces the best tasting macarons possible. Our macarons are always made in small batches. They are naturally gluten-free and are handcrafted with love. We make all of our own fillings and pride ourselves on respecting the ingredients & the macaron.